Photovoltaic panels, or PV panels, are solar panels that directly convert sunlight into useable electricity. The “photo” part of the word refers to light, while “voltaic” refers to electricity. The PV panel, most often installed on top of homes or businesses, is made up of several smaller photovoltaic cells that each contribute to the overall power the panel produces. In the same manner, multiple photovoltaic panels can be wired together to create an even larger source of electricity, such as a solar power plant. How do The Panels Produce Power? How PV panels produce power has a lot to do with how they are created. 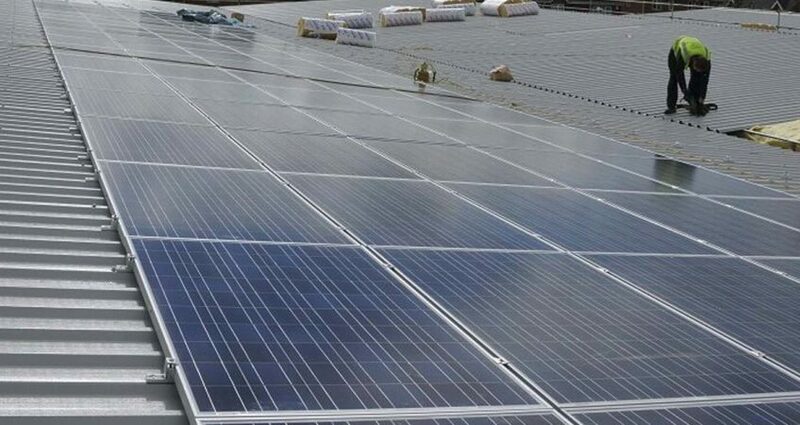 These panels are composed of several solar cells that have photovoltaic materials, such as polycrystalline silicon, amorphous silicon and cadmium telluride. They also include several modules that have multiple cells, each with a protective layer on top that has been treated with silicon and a layer below made of polymer. Each layer has to be treated before it is installed to ensure its connectivity. The protective (top) layer is treated to give it a negative charge, whereas the polymer (bottom) layer is treated to provide it with a positive charge. In short, when the sunlight contacts the top layer it causes the electrons from the silicon to detach, move to the top layer, and produce electricity. This electricity is then used by the consumer. Any excess, or unused, power is transferred into a local utility grid. The utility grid is the device by which the power is distributed for consumer use. If PV Panel Power Comes from Sunlight, How Will I have Electricity at Night? A common concern when it comes to photovoltaic panels is how will my home or business have electricity once the sun has gone down. Because solar panels receive their “power” from sunlight many people have questions as to how they are able to operate at night when there isn’t any sunlight present. There is a simple answer to this question. When there isn’t sunlight, the excess power that was transferred to the power grid earlier becomes the source of electricity. This is why it is important to remain connected to a power grid even if you have PV panels installed to ensure electricity 24 hours a day. What is the Main Benefit of Installing Photovoltaic Panels? The main benefit received from installing photovoltaic panels comes in the form of reduced utility bills. Traditionally, all your power would be generated from your local utility company. With panels, you only depend on power from your local utility plant’s power grid at night. Which means you are only charged for electricity during a small portion of the day. The amount of cost savings you receive will depend on the amount of power you use during the day and the amount of excess power you have stored. Homeowners receive credit for any excess power that is unused and transferred to the power grid, often referred to as power credits. You are only required to pay electricity cost when you have used up these credits. Some home and business-owners have reported savings of more than 75% on the monthly electricity cost.